@ North Beach Bandshell in Miami Beach. Bossa Nova = Nouvelle Vague = New Wave. new and brilliant talents along the way: Camille, Phoebe Killdeer (whose Fade Out Lines was remixed by The Avener,) Élodie Frégé, Mélanie Pain, and, soon, Liset Alea. The gambit paid off, with sales of over one million records over four albums released between 2004 and 2010, and world tours that included stops at venues such as London’s Royal Albert Hall, L.A.’s Hollywood Bowl and Paris’ Olympia. Since 2011, Nouvelle Vague had stopped recording, focusing on an innovative live show created in collaboration with the mythical Jean-Charles de Castelbajac (Ceremony and Dawn Of Innocence,) and branching out into different projects: Olivier’s Uncovered Queen of the Stone Age, and Marc’s Bristol, along with his Kwaidan label. 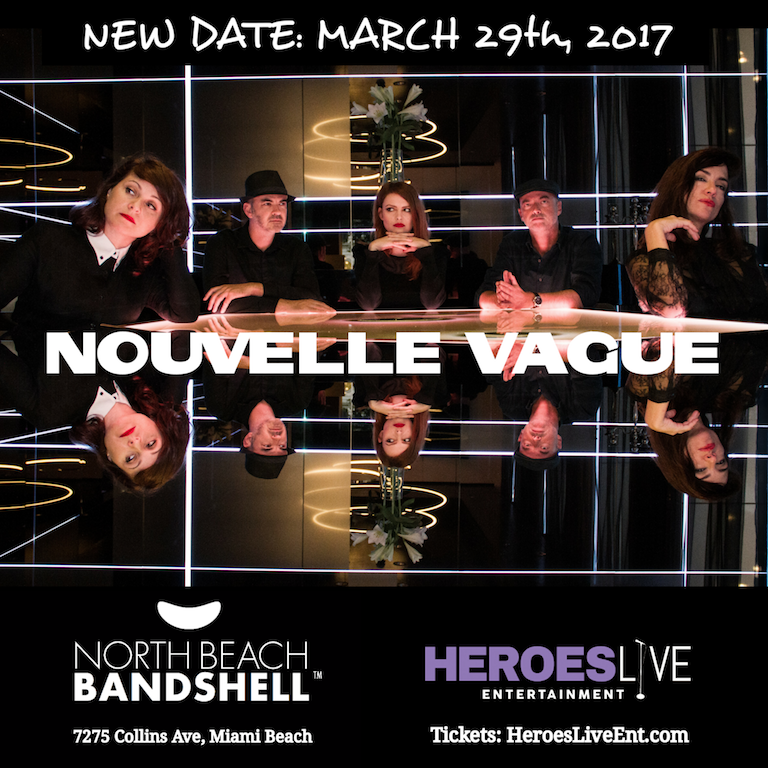 The time seems right to write a new chapter in the Nouvelle Vague saga: with a new album “I Could Be Happy” and live show, the band and its coterie of female vocalists continue their time travels with a renewed alegria. At 15 she began to study the voice with America Crespo, a Cuban opera legend and Musical Theater at Miami’s New World School of the Arts. At 19 she moves to New York, a waitress by night, she enters the New School Jazz Conservatory for Vocal Jazz and buys her first guitar. She becomes the front woman of the electronic band Etro Anime, co-writes their 1st album which is released through V2. After witnessing the fall of the World Trade Center, she leaves the United States to Amsterdam with the band. They embark upon a tour supporting Kosheen and later Llorca where she meets Alexkid with whom she writes and records ‘Come with Me’ on his “Mint” album. “Come with Me” becomes an instant electro club and radio hit and she joins Alexkid’s band for a 46 dates European tour. While not on the road she starts working on what will become “Heart- Headed”, her new album co-produced alongside by Marc Collin. Months in the making, “Heart-Headed” displays a balance of craft and emotion and exhibits the refined craftsmanship of her writing.